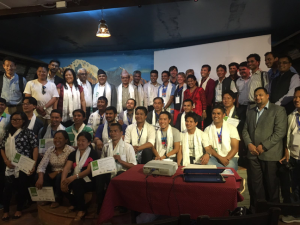 Adventure travel guides from around Nepal came together in Kathmandu for the inaugural AdventureEDU Guide Training held June 13 – 20, 2016. With over eighty applicants, the twenty-two pre-selected guides, including three women, attended the training to help improve current skills and gain new perspectives on how to accelerate themselves as leaders in the adventure travel guiding industry. 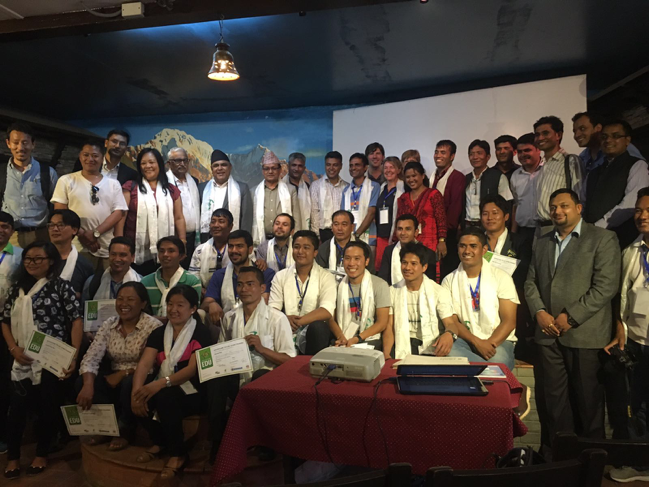 This training was a collaborative effort by the Adventure Travel Trade Association (ATTA), in partnership with Wilderness Medical Associates International and Samarth-Nepal Market Development Program (funded by UK Aid) through its Great Himalaya Trails program. 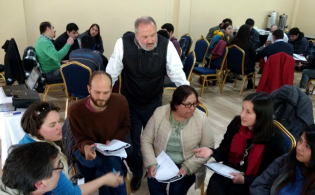 Three AdventureEDU educators led the first five days of the course: Jean-Claude Razel and Dan Moore led the instruction of course materials along while Gordon Janow facilitated the overall training. The final three days of the training focused on Wilderness First Aid led by Susan Purvis and Peggy Miller of Wilderness Medical Associates International. The 8-day course started at the Trekking Agencies Association of Nepal (TAAN) facility in Kathmandu with two days of classroom lessons. Course content expanded upon the recently released International Adventure Travel Guide Qualification and Performance Standard. Then, participants traveled to Shivapuri Nagarjun National Park in the Kathmandu Valley for two days of immersive field sessions focused on applying and refining skills taught in the classroom. This included how to model and convey Leave No Trace Principles in a group setting, applying natural and cultural history interpretation techniques and refining general technical skills. Even though most participants usually guide on well-traveled trails, the training covered orienteering — an important skill to support a more robust safety and risk management plan. The two day field session provided a dynamic environment for participants to use realistic scenarios to further develop skills. 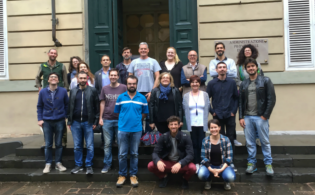 Everyone returned to the TAAN facility on day five to review lessons learned and complete a final exam. The course wrapped up with three days of Wilderness First Aid training provided by Wilderness Medical Associates International. Course curriculum centered around altitude sickness and treatment plans, musculoskeletal injuries and wound management, basic life support skills, and long-term patient care in a wilderness setting. 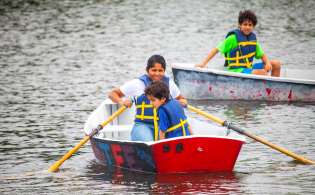 Topics were taught both in classroom and outdoors with realistic scenarios. 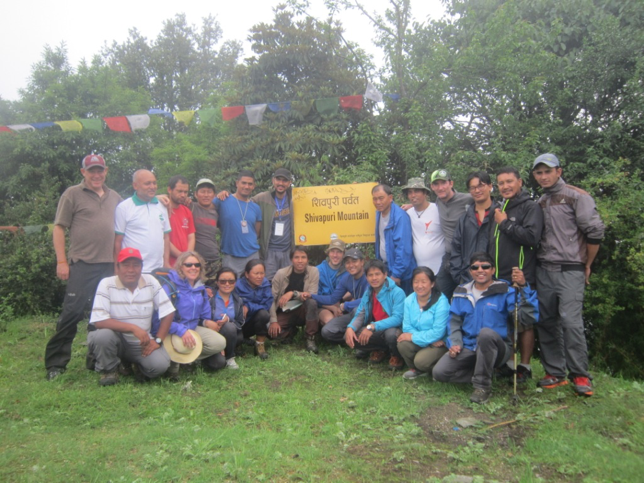 At the end of the course, participants received an Adventure Travel Guide Training Program certificate of completion and digital badge as well as a Wilderness First Aid certification valid for three years. 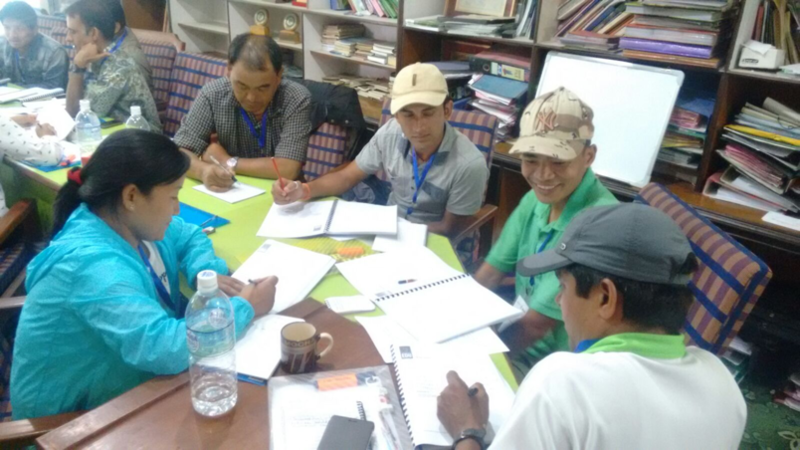 The Samarth-Nepal Market Development Program hopes to support similar training programs in the future with the same objectives: to help elevate the ability of local guides to take on the role of a trip leader, and improve the quality of experiences offered to tourists and enhance the industry standards.